Few consider how the summer months impact our carpets. We are too busy scheduling the summer vacation, activities, and other fun that comes with summer and warm weather. Knowing how the summer can have negative effects on the carpets can give you the upper hand with enough notice. To help avoid the impact of summer on carpets, we at Leading Carpet Cleaning would like to share the likely dangers summer can bring. 1) Mold, Germs, Bacteria & Microbe Growth. The summer months create the right conditions to produce mold, mildew, and other bacteria. The summer heat and the inevitable moisture trapped in the carpets produce optimal sustenance. Carpets are often riddled with mold spores, mildew and other forms of bacteria. With the heat from hot summers and the moisture from pool fun, water activities, or summer rain, will easily produce mold and mildew growth. Mold does especially well in darkness, many times the mold growth occurs under the carpets and many homeowners do not realize the mold until it has done extensive damage. To prevent the mold and mildew growth, try to keep your home dry using dehumidifiers. When the kids play in pool or water games, ensure they dry before coming inside or they directly shower and dry out before lounging on the carpet. If water or any liquid makes contact with the carpet, quickly towel-dry the area. Make certain the windows are securely closed during the summer rainstorm. 2) Pests & Allergens in Carpets. Allergens are at high volume during the summer months and the pests are very active. Both of these nuisances have a tendency to easily make their way into our homes in an endless amount of different ways. The carpets harbor these unfortunate invaders more so in the summer than the rest of the year. Routine vacuuming can collect a lot of allergens and insects that make their way in, change the air filters regularly, and keep the lawn, shrubs, and trees trimmed and pruned away from the house to help reduce the volume of both pests and allergens. 3) Sun Fading of Carpet. The sun’s direct sunlight fade the carpet’s color. The intensity of the UV rays is more so in the summer and as they shine through the window the carpets slowly damage and the colors fade. Carpets fading and sun dried make it look dull and dingy. Though it’s not obvious, when the furniture is moved, the comparison is obvious. To avoid the direct sunlight from blazing through the windows invest in window treatments such as curtains, drapes, blinds, and/or UV films to preserve the carpets color and integrity. Also, moving the furniture around every so often to even the wear helps as well. 4) Extra Foot Traffic on Carpet. Foot traffic increases in the summer months between the kids being home and the additional visitors that frequently stop by. With more foot traffic becomes more abuse and more dirt and debris that get tracked in. If not managed, the carpets can take toll. To control the dirt and debris put outdoor walk-off mats at the doors and sweep them off regularly. Place indoor mats and runners and implement a “no shoes worn on carpet” rule. Vacuum daily and be sure to maintain your vacuum. With professional deep cleaning, the deep root dirt and debris is extracted, along with allergens, pollutants, insects, insect eggs, stains, and odors to ensure your carpets are equally beautiful throughout the summer. Call Leading Carpet Cleaning today to schedule your comprehensive carpet cleaning service! Tile flooring is commonly found in many areas of the home, some more so than others. Typically, the kitchen and bathrooms are the most common tiled areas, but there are other places like the laundry room and foyer that are frequently tiled as well. Tile is a great choice for these areas as they are durable, stylish, and handle excessive moisture. With so many tile choices, it is not inconceivable that homeowners are providing care and maintenance for both natural stone and man-made tile. However, it is important that you know how to properly care for them to avoid expediting the deterioration and reducing the condition and aesthetics. 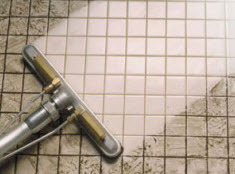 We at Leading Carpet Cleaning would like share natural stone tile versus man-made tile maintenance. With natural stone tile, there are no two pieces that are identical, making the floor patterns unique with the low to high variations in the veining, shading, and colors, depending on the type of natural stone. In residential applications, the top common choices are travertine, marble, limestone, granite, slate, and quartzite, among others. Those that prefer the more uniformed style choices can get the customized look with ceramic and porcelain man-made tile. Applying sealants is the biggest difference between maintenance for natural and man-made tile. Installers are not always diligent, but at the time of installation, natural stone tile should be sealed. However, through the passage of time and normal wear, the sealants eventually deplete, and they will need a fresh coat. Typically, at the time of installation, tiles are sealed after they are installed, followed by adding the grout and finally a last coat of sealant. Depending on the foot traffic, care, and cleaning practices, sealants will need to be reapplied every 6-12 months. The sealants help resist soil, moisture, and other contaminants from absorbing into the tile and grout. Without the sealers, the tile and grout will quickly look dingy and dull caused by the assortment of debris. If you are unsure if your tile was sealed, or if the coat has dissipated, you can perform an easy test. Use about an ounce of water to pour on the tile. You need a coat of sealant if the water absorbs into tile/grout in under a minute. Before a sealing application, the tile and grout should get a deep cleaning, otherwise it will get trapped under the sealer. To ensure maximum results, invest in a professional deep tile/grout cleaning, followed by a professional sealant application. If you decide to do it yourself the floor should be dry after a deep clean before applying the sealant. There are many cleaners that are designed for specific natural stones. We recommend using the generally natural stone cleaner for both natural stone and mad-made tile because they are formulated to be gentle enough to not cause any damage to the and grout as well as not to dissolve the sealants, but tough enough to remove the spots and dirt. Note: Providing you prefer DIY cleaning concoctions, avoid using vinegar. As an acid substance, it will corrode the sealers and polish from polished stones and cause potential damage to the grout and tile with excessive use. To clean your tile and grout in between professional cleanings, sweep up the debris daily, or as often as possible, and mop at least once a week with an effective cleaner. When your tile and grout is due for a deep clean and/or sealer, call the experts of Leading Carpet Cleaning and let our elite specialists treat your tile and grout to optimize your clean and aesthetics. Are you one of the 36 million Americans households that love their feline pets? If your answer is yes, you are clearly not alone! It is estimated that 30% of Americans own a cat. Today Leading Carpet Cleaning will share with you the history of cats, why cats are found to be such endearing pets, diseases to be aware of if you have cats living in your home, and how to keep those carpets clean of cat urine and feces. Why Were Cats Domesticated & How Long Have They Been Pets? Scientists have labeled cats as civilization’s pet. Humans used to rely on hunting as their primary source of meat. Hunting dogs were domesticated out of necessity to help obtain food. Cats however, only became domesticated as people started to form civilizations. With the formation of civilizations came surplus crops and storehouses. Those storehouses led to mice. It is believed that the first wild cats followed the mice into civilization. People were delighted by the pest control they provided and began to domesticate them. Archaeologists discovered a cat in the Egyptian tombs that date back to 12,000 years ago. After making that discovery, it is now widely believed that humans have loved their cats for the last 12,000 years! Cats have made loving companions for families all over the world. Studies show that owning a cat has health benefits that include reducing stress and anxiety, decreasing the risk of stroke, boosting your immunity, and lowering blood pressure and cholesterol levels. In addition to those benefits, they provide companionship and reduce feelings of loneliness for their owners. Can Cat Urine & Feces on Carpet Cause Illness in Humans? With all of those amazing benefits, there are also a few words of caution for cat owners. Cat feces and urine are known to cause two different illnesses – Escherichia coli bacterial infection and toxoplasmosis. Escherichia Coli bacterial infection, commonly known as E.coli, can affect your urinary tract and cause cramping and diarrhea. Typically if one family member is infected with E.Coli, another family member will be infected as well. E.Coli infections can be effectively treated with antibiotic treatment. Toxoplasmosis may cause flu-like symptoms of fever, body aches, and diarrhea. Fortunately healthy humans frequently don’t even know they have been affected by toxoplasmosis. Healthy immune systems will fight off the infection without us ever knowing that we are ill. If your body is unable to fight it off medication will be necessary and medical treatment should be sought. To prevent these illnesses cat owners should make sure that they safely handle the litter box, maintain a clean litter box at all times, and ensure that their carpets, rugs, and upholstery are frequently cleaned to remove cat feces and urine. Cat feces and urine left in carpets are not always visible to the naked eye. Children and adults alike run the risk of illness when cat feces and urine are not thoroughly cleaned out of carpets. Here at Leading Carpet Cleaning we have a specially formulated enzyme carpet, rug, and upholstery formula to lift pet stains and extract the attached odors. Call us today so that we can schedule your expert carpet cleaning! There are many people who are surprised to learn how easily it is to ruin your upholstery even when you attempt to clean a simple stain. Yes, you can create an even worse stain by using a simple water mixture to remove another stain. Water, more often than not, will leave behind a brown or a white ring stain on upholstery. Leading Carpet Cleaning will explain how water is staining your upholstery and how the mistake can be corrected. Why Does Water Stain Upholstery? So why does water leave brown or white ring like stains on upholstery? You may have read or have been told to mix together water with vinegar or dish soap and ammonia to remove a stain. However, what many people fail to mention is that you must use distilled water and not tap water. Tap water is what causes the white or brown stain after cleaning a stain on upholstery. Tap water is cleaned and treated to make sure it is safe to drink and bathe in. However, it isn’t necessarily safe for your carpets or upholstery. The minerals in tap water are left behind which result in the white or brown stains. Water stains can appear as brown spots or as white rings on upholstery. They usually appear in the spot your recently cleaned. 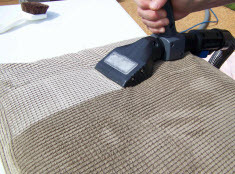 Sometime water stains can even cause discoloration in a few types of upholstery fabric. The white rings or brown spots are from the minerals that are found in your tap water. As the water dries, the minerals will begin to appear. Usually if the water is left unattended or air dries, the stains are usually worse. If you help the area dry quicker with a fan, most of the time the minerals don’t stain nearly as bad. To remove water stains, start by re-dampening the affected area with pure distilled water. Do this by blotting with distilled water on the stain and around the edges. Using distilled white vinegar and a cloth, blot at the affected area with straight vinegar. No need for fancy mixtures. Let the distilled vinegar sit on the stain for a few minutes to break up and then break down the mineral inside the water. After ten to fifteen minutes you will want to rinse the vinegar out. Once again, use distilled water by lightly misting the area with a spray bottle. Blot the area dry. If some of the water stain remains behind repeat the same cleaning method, Depending on how deep the stain is inside the upholstery, it may take two or even three times before the stain is completely gone. Remember to avoid using tap water on upholstery and even on carpet. Tap water contains too many minerals that can stain both upholstery and carpets. Also never leave water to dry on its own. Instead, remove as much as the moisture as possible. You may even use a fan to help them dry faster. 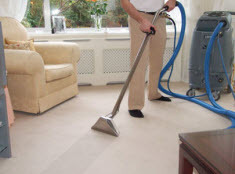 If you need professional carpet or upholstery cleaning, Leading Carpet Cleaning provides those services and more. To schedule our services contact Leading Carpet Cleaning.